Anyway, last week I had a week off work with plenty of time free while my daughter has been at school, so i managed to 'plan' with bits of track for two days before settling on a simple trackplan for a terminus station which will be the main access to a pub and beer garden. The pub being modelled on a certain small pub on the CCLR. Today, I have got the track laid, wired and tested but have run into a small problem - everything works apart the loco refuses point blank to do anything on the switch blades of one point, it just stops. Headshunt, split into 2 sections, both sections working OK.
Connect track to upper line, isolated on one rail from the other point. Platform Line (lower track), connected with one rail isolated. All sections work when switched on, its just the blades on that point, I've swapped to the with a different one, still the same. Anys suggestions as to what the problem is??? (Im sure it will be a simple oversight on my part). 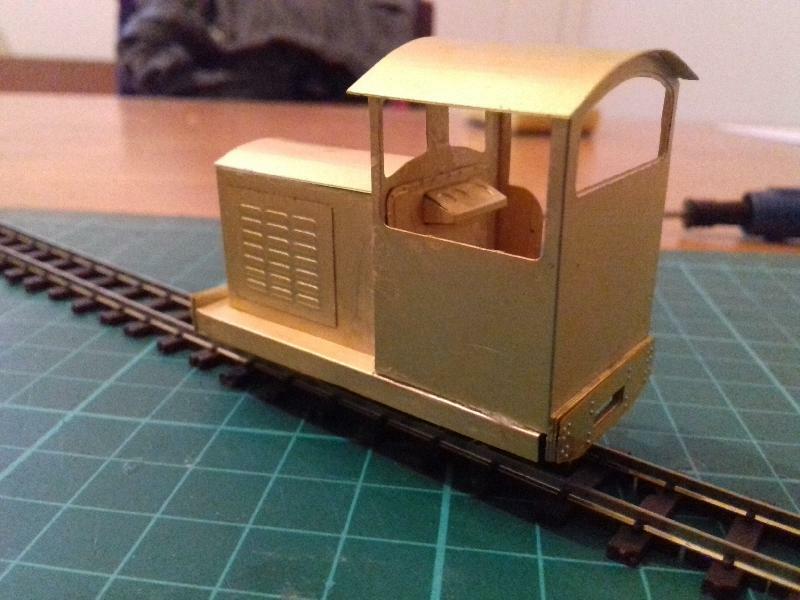 Below are a couple of shots of the loco in the picture in quarter-build stage - inspired by DA1 at the CCLR, a loco I have a soft spot for. Sorry to hear about your point problems. 1. the wiring plan is wrong. 2. there is a bad connection in the joint in the fish plate between the fixed rail near the point frog and the moving part. (I've seen this many times and I aways solder a wire to jump than part so the power feeds from both directions). if you are good a soldering you can put a little flexiable wire over the joint. make sure the blade can still move. If you are not good a soldering then stay well away from this area!. The other solution is put a wires on each section of the point. Sorry don't have time to draw a diagram right now. will do later if some else hasn't already done one. Can you draw a diagram (or take a photo) and show us exactly where the wires are soldered on to the point? I've had the problem that Glen describes (No.2) above. On one I did as he says with the additional wire. But on the other I found that just rubbing over it with a graphite stick cured the problem...graphite goes down into the fish plate and between blade end and side rail and re-establishes the connection without all the faff of soldering wires on....if the problem turns out to be elsewhere then you haven't really wasted must effort with this fix. If you have two electrofrog points nose to nose, you need to have insulating fishplates between the two. You'll get a short if the blades are in the wrong position. Looks like an interesting project Dave. I can't put my finger on the electrical issue but the points do look re-used, could this lead to problems? Colin Peake wrote: Looks like an interesting project Dave. I can't put my finger on the electrical issue but the points do look re-used, could this lead to problems? At almost the same time you posted your message, I had a brainwave!!! After checking, re-checking and re-re-checking every electrical connection around the point, I hadnt check to sodding blades on the point on the top line!!!!!!!!!! It was slightly out and not making a good connection, a little tweak and we're running again - thanks to those that offered suggestions. I will certainly be having a look for those pictures, dont think Ive seen DA1 in action since it hauled our train in August 2008 with my (then) 11 month old daughter on board. Like the idea behind your layout. Do you have more info about the loco (prototype and your model)? The prototype is a 4 wheel loco originally built by the Bush Mills Railway as an assistant to (I believe), Mountaineer because it struggled to pull 5 coaches on its own. Not sure when it was moved to Cleethorpes, but Im sure someone will provide the answer soon. The DA in the loco number has one of two meanings, depending who you are talking to, some will say it stands for 'Diesel Assistant', others say 'Diesel Auxiliary'. Ive always referred to it as Diesel Auxiliary. If you search 'cclr da1' on google, there is a couple of links to other forums' discussions about it, and theres also a few pictures on google too. As for the model, the chassis is from a Bachamnn Plymouth shunter, the rest is 40thou plasticard - simples. Evidently, plenty o work still to do on it at this stage, but will keep the thread updated. Thanks for the info. Looking forward to the next update. 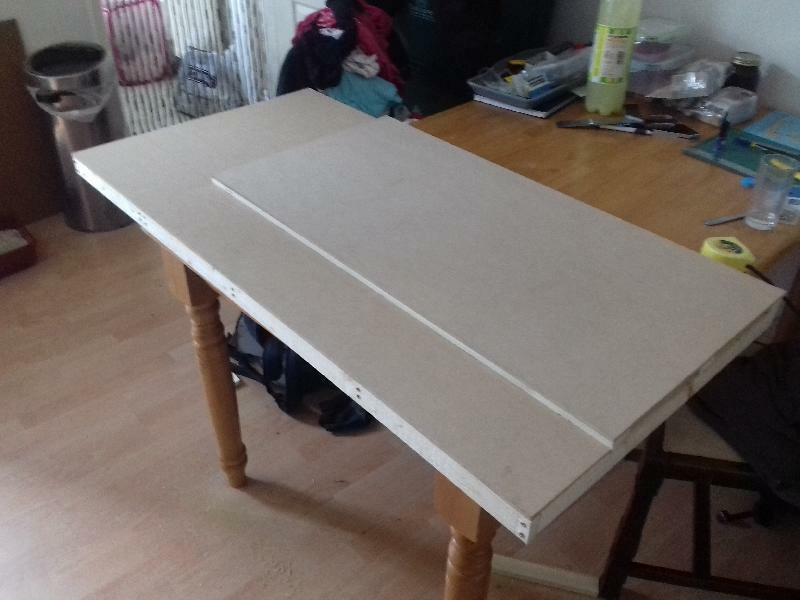 Well, its been a few months and not alot of work has been carried out on the layout due to looking for a new place to live. Thankfully, we moved into the new place 11 days ago and things are just about sorted and I can now start to get my modelling head back in gear. Thankfully, SWMBO agreed we needed a cellar for my railway antics and once the last few boxes are sorted out, plans can be formulated and the beer garden terminus can be moved to its new home. Also, because the cellar is all mine, there is definately an extension of the line in the pipeline, of which i will report on as and when this happens. Finally, does anyone know if the bachman plymouth will still work after accidentally being frozen for 72 hours during the move? Im suspecting its not going to be good news. I'd strip it down, wash all the bits in warm water/fairy liquid with an old toothbrush, then reassemble and oil, and it ought to be fine? the freezing shouldn't have caused trouble unless there was water in the mechanism (which would be a bigger worry), but might affect the grease/oil, so I'd wash it out and replace. Bachmann always tend to put too much grease on things anyway, cleaning it all off and just adding a spot of proper modelling oil often makes things work better anyway. Images below show todays progress after adding the planking to the walls, window ledges and the boards for the pub name. It has only just received a thin coat of paint hence the shine in the images. Back again, after ditching SWMBO and moving into my own gaff with a view over the south of Doncaster station, the modelling mojo is coming back. 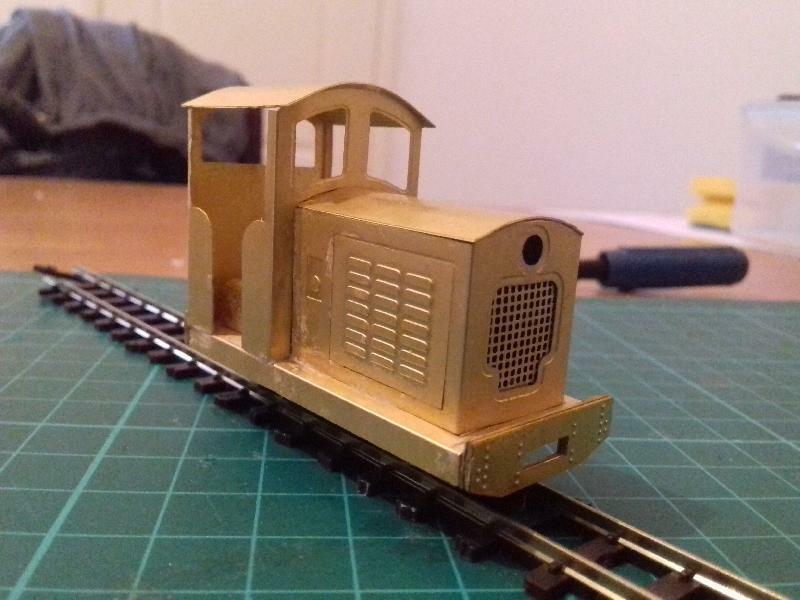 Last month I got round to ordering a brass kit from Minimum Gauge Models which finally arrived yesterday (the mail service managed to lose the first one, Allen quickly sorted a replacement). Today I got out the file, knife and glue and got sticking. I really can't believe how easy the kit flew together considering it's the first ever kit I've built. Just goes to show that ANYBODY can build an MGM kit and I'm pretty sure I'll be getting some other bits. What did you use for glue? That little diesel really looks excellent. Maybe it was drastic, but it was necessary.